Abi Scheid drives to the basket. The junior forward contributed 18 points in NU’s overtime loss. 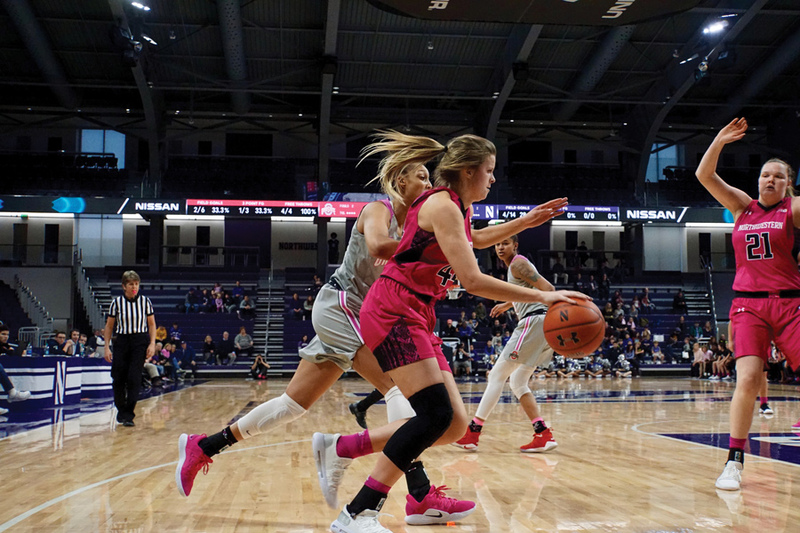 With four seconds to go in a tie game at Minnesota and two shots from the free throw line on the way, junior forward Abi Scheid had the perfect chance to become Northwestern’s hero in a game against her hometown team. The Wildcats had improbably climbed back from a 14-point first half deficit and took the lead following a layup from Scheid with two minutes remaining in the contest. Then, the 79 percent free-throw shooter from Elk River, Minnesota, had the game in her hands. She missed both shots, and NU lost in overtime. Even though Scheid was at full strength after recently missing about a month of time with an injury, the Wildcats (14-10, 7-6 Big Ten) would go on to lose the Sunday afternoon matchup with the Golden Gophers (17-7, 6-7), 73-64 in overtime. Despite Scheid’s hot shooting, the team turned the ball over an astounding 26 times, seven more offensive miscues than their previous season high and nearly 13 more than their season average coming into the contest. Minnesota’s defense was stifling, led by guards Kenisha Bell and Jasmine Brunson, employing the same three-quarter court press they used effectively in a win in Evanston just 10 days ago. Once again, NU could not figure out how to break the air-tight defensive scheme as they frequently forced passes, lost the ball out of bounds and committed offensive fouls. As a result, NU’s usual stars couldn’t find their rhythm against the Golden Gophers. Senior forward Pallas Kunaiyi-Akpanah finished with 6 points and 8 rebounds, marking the first time she didn’t hit double-digit figures in at least one of the two categories in the entirety of this season’s conference play. Sophomore guard Lindsey Pulliam, NU’s leading scorer, recorded just 10 points and tied her second-lowest total on the year. In spite of the Cats’ inability to take care of the ball, the team stayed in the game on the backs of huge offensive contributions from Scheid, who had 18 points on 4-6 shooting from behind the arc, and sophomore guard Jordan Hamilton, who scored a team-high 20 points. Both players were limited by injury in the last game against Minnesota, as Scheid missed the matchup and Hamilton played just 17 minutes, scoring only 2 points. They were matched on the other side of the floor by Bell, who stuffed the stat sheet with 24 points, 11 rebounds, 5 assists and 5 steals. While the Minnesota star turned the ball over 7 of the Golden Gophers’ 21 times, NU was largely unable to capitalize, scoring only 17 points off of turnovers. The Cats did a good job adjusting their defense to contend with Minnesota guard Destiny Pitts, who finished with 21 points and hit her first four shots from three-point land but missed her next six as her scoring luck ran out.